When I arrived in Canada three years ago, I was excited to explore the outdoors. Having lived in Belgium for 21 years, where the highest “mountain” is 694 metres high, the prospect of having the Coast Mountains on my doorstep was exhilarating! 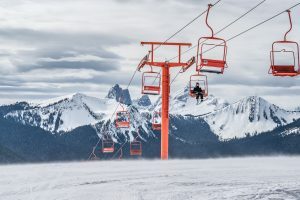 On one of our first weekends, Ash and I booked a trip to Whistler and we fell in love with the mountains, the village’s buzzing vibe and the fun activities on offer. 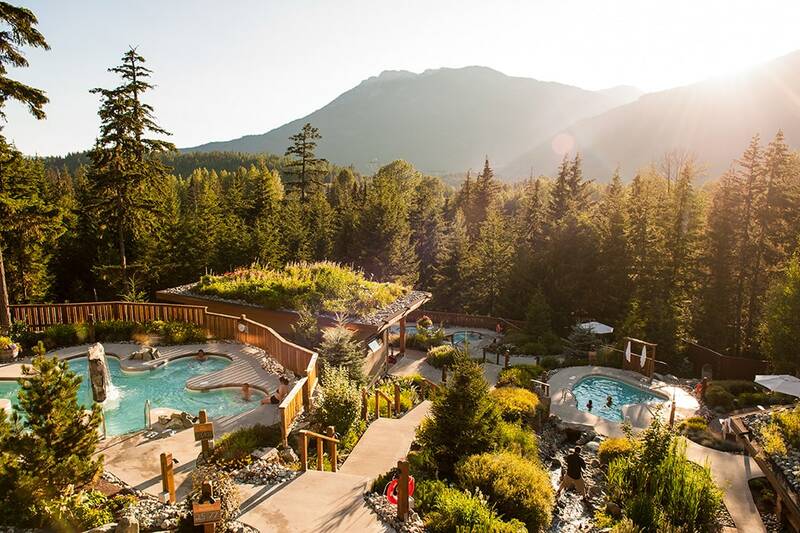 We have since visited Whistler on multiple occasions throughout the year, and the village has become our go-to destination when we need to escape from the city. 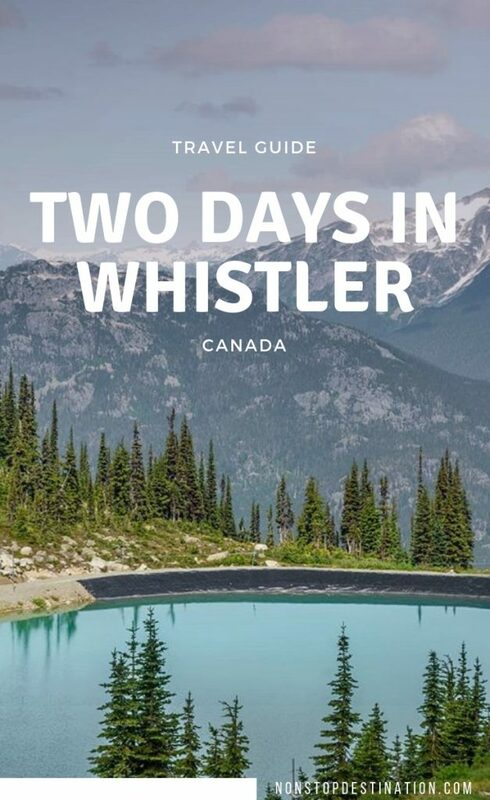 So when my sister came to visit me in Vancouver a month ago, I added Whistler to the list of must-see places on our itinerary. 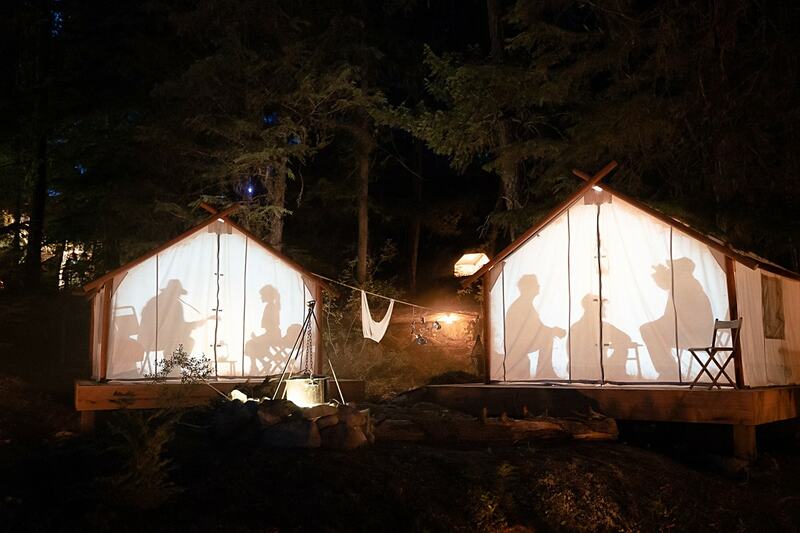 I wanted to introduce her to the Pacific Northwest (PNW) way of life — and what better way than to spend two days in British Columbia’s outdoor playground? We set off early from Vancouver, travelling along the Sea to Sky Highway — one of the most beautiful roads in Canada, if not the world. The weather was warm, albeit rather hazy, due to the wildfires in BC. We stopped at the Sea to Sky Gondola, to catch the stunning views over Howe Sound. 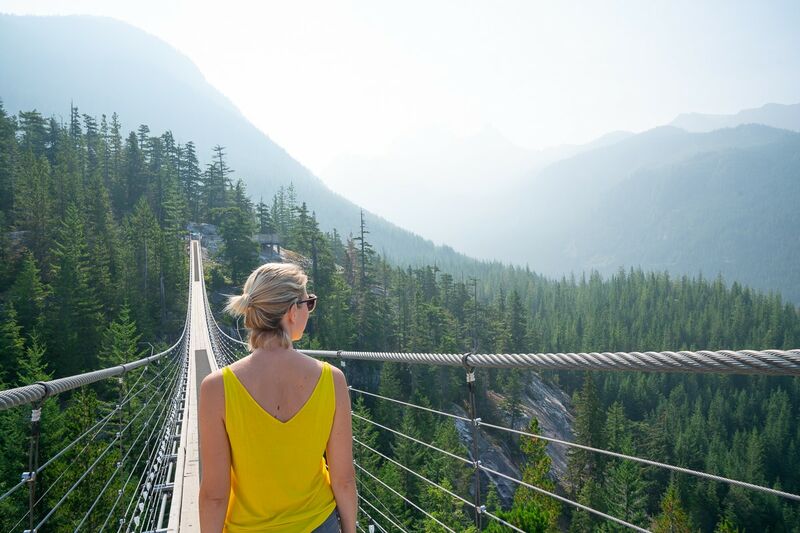 Even though the smoke obscured the views, my sister loved the suspension bridge and the small trails around the area. Before we continued our drive, we briefly passed by Shannon Falls, a five-minute walk from the gondola. 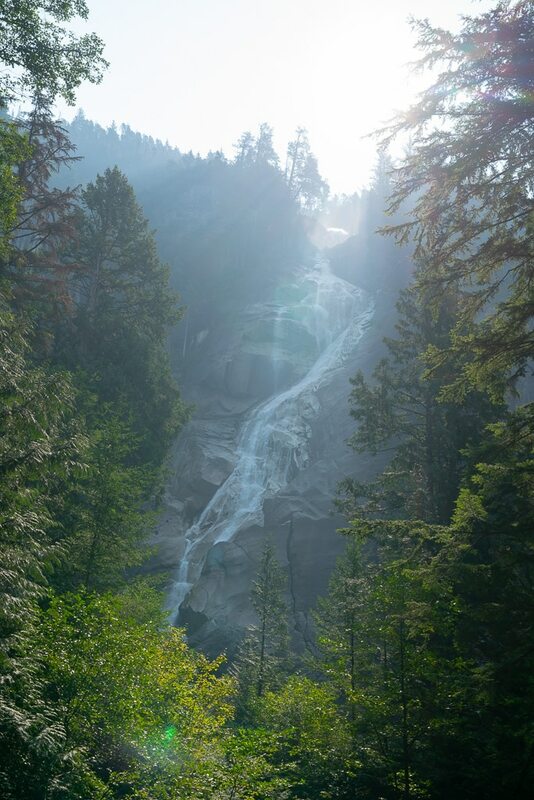 At 335 metres, Shannon Falls is the third highest waterfall in the province and one of my favourites to visit; it is easily accessible, and an impressive sight to behold from the base! Back on the road, I was happy to see that the traffic wasn’t too crazy. 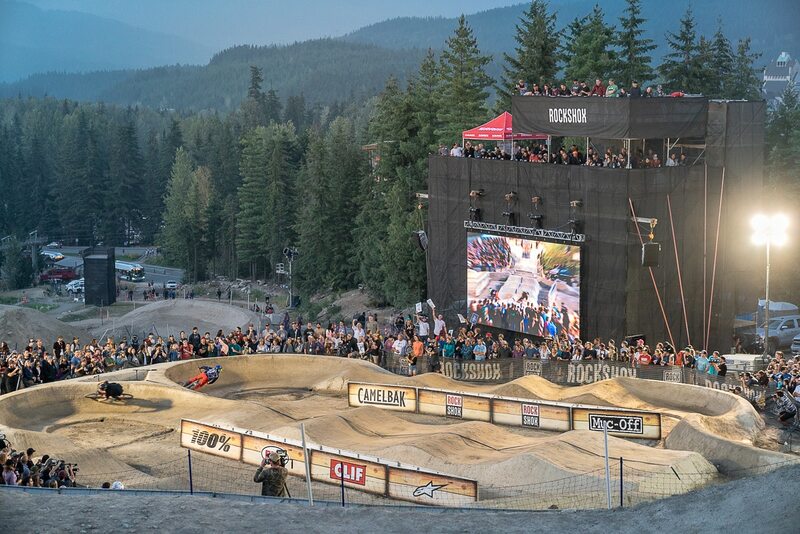 The trip to Whistler can get busy, especially over the weekend. But since it was Thursday, the road was peacefully quiet. The reduced visibility thwarted my attempts to be the perfect guide for my sister. Instead, as I was pointing out invisible, stellar vistas and mountain tops, she had to simply use her imagination. 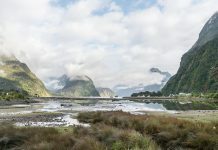 On the rare moments when we encountered a pocket of reduced haze, my sister would move forward in her seat and take in the beautiful scenery, which was gradually revealing itself… Nature sure is a tease! It was noon when we arrived in Whistler. 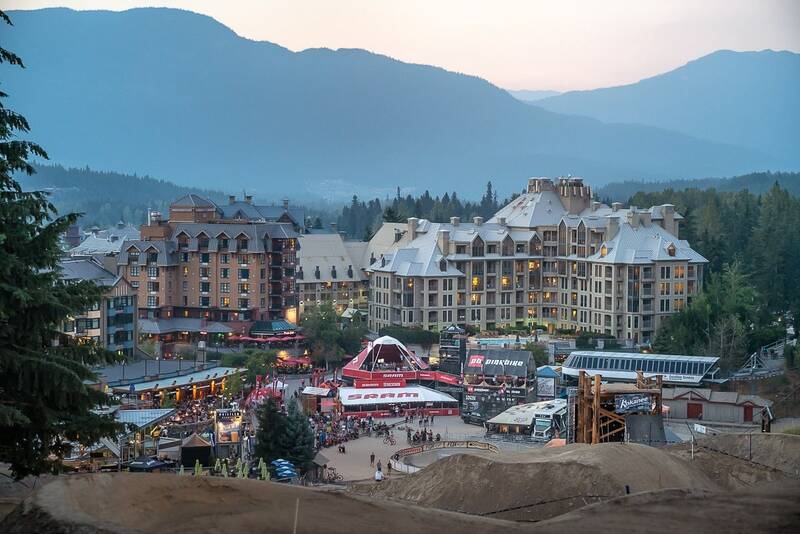 Apart from the usual touristy crowds, the village was abuzz with mountain bike enthusiasts, who had come down to Canada for Crankworx, a week-long mountain biking event. 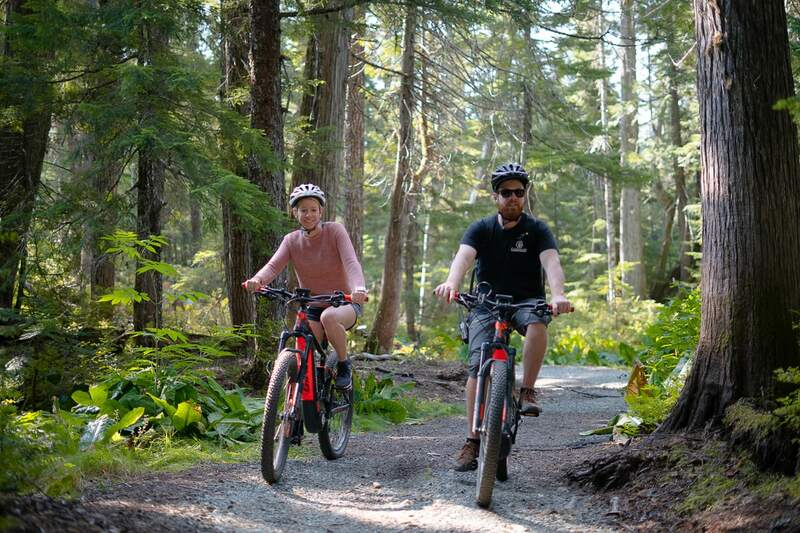 The sport is big in Whistler throughout the summer, with trails spread across four mountain zones, each spanning different levels. 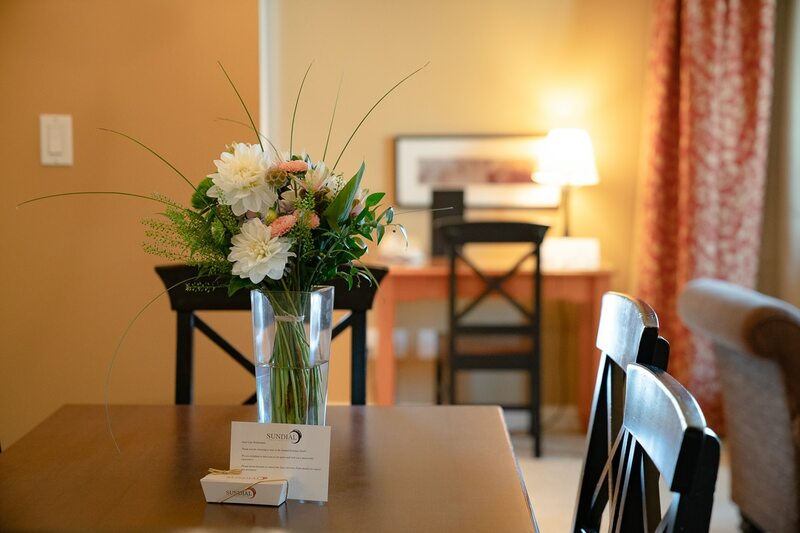 Before heading up into the mountains, we checked into the Sundial Boutique Hotel. 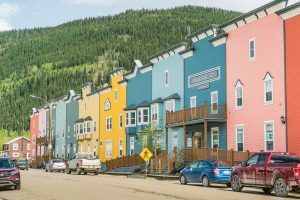 The hotel is located right in the village near the gondola and offers one- to two-bedroom suites. Our room was the epitome of cosiness, equipped with a separate living room, a fireplace and a snug, soft throw on the bed for the cooler nights. 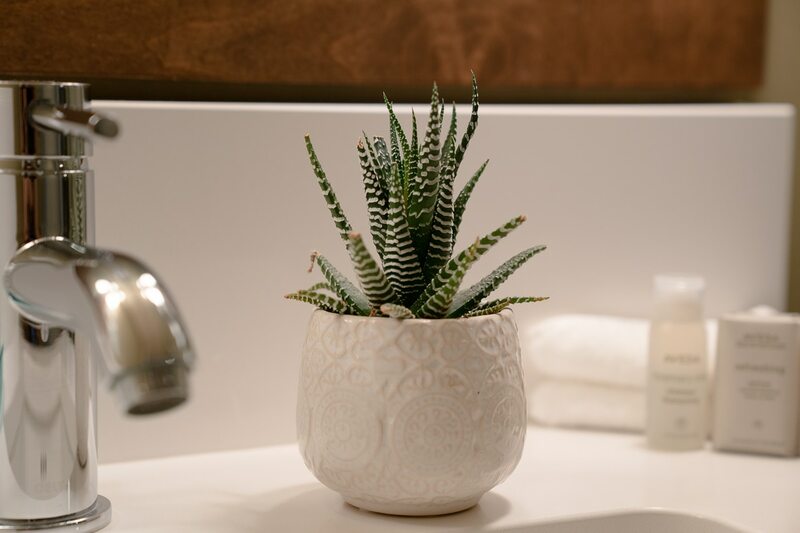 Plus, all the hotel’s suites offer fully equipped kitchens, where you have everything you require on-hand to whip up a delicious breakfast, lunch or dinner. 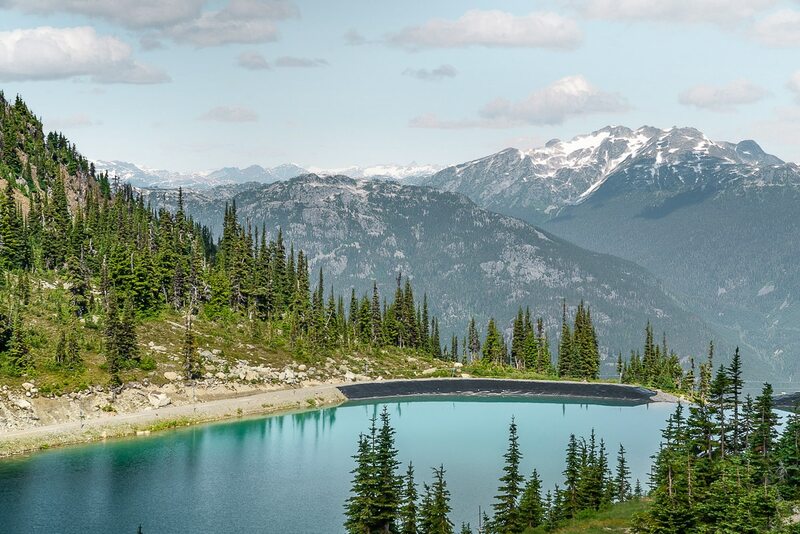 After a quick freshening-up session, we took the gondola up Whistler Mountain… This is a serene experience where you can take in the views all around you. Once atop the mountain, we grabbed a bite to eat at the Roundhouse Lodge. 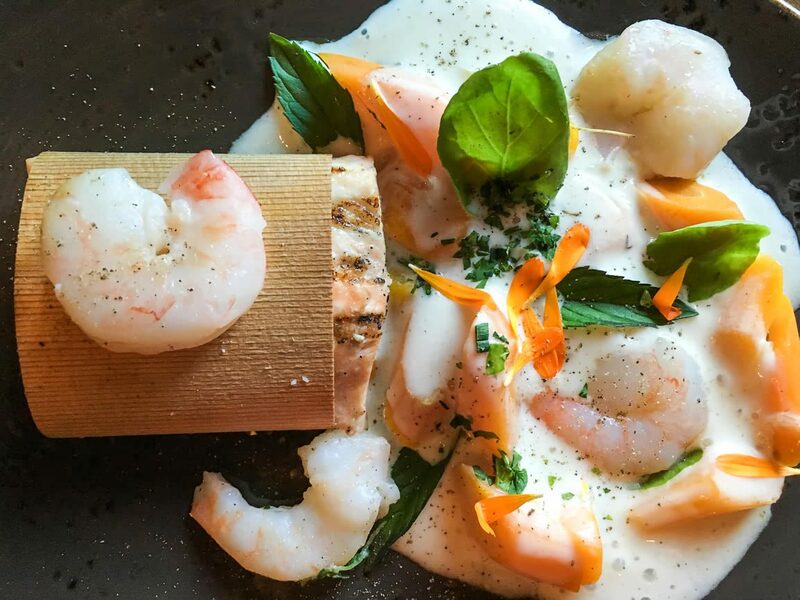 Accompanied by a delicious Chardonnay wine, we relaxed on the marvelous outdoor terrace overlooking the valley, before tackling the many options available to visitors. 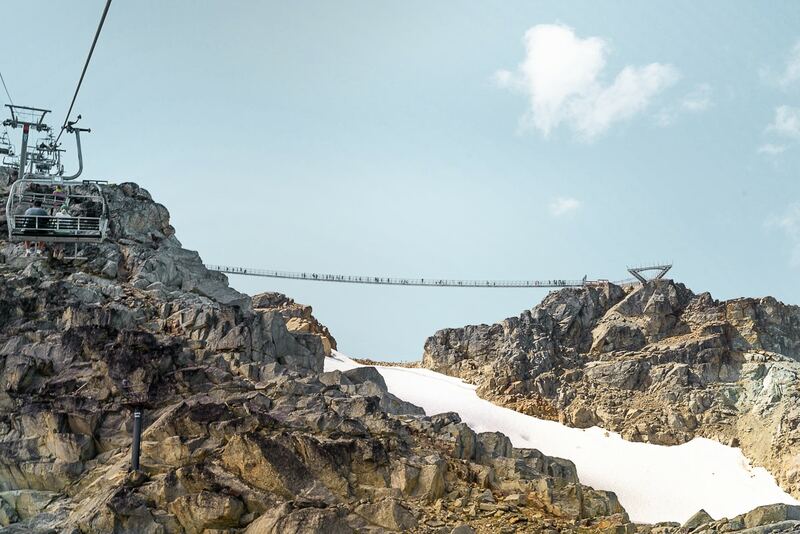 New to it this year was the Cloudraker Skybridge, a suspension bridge on the peak of Whistler Mountain. 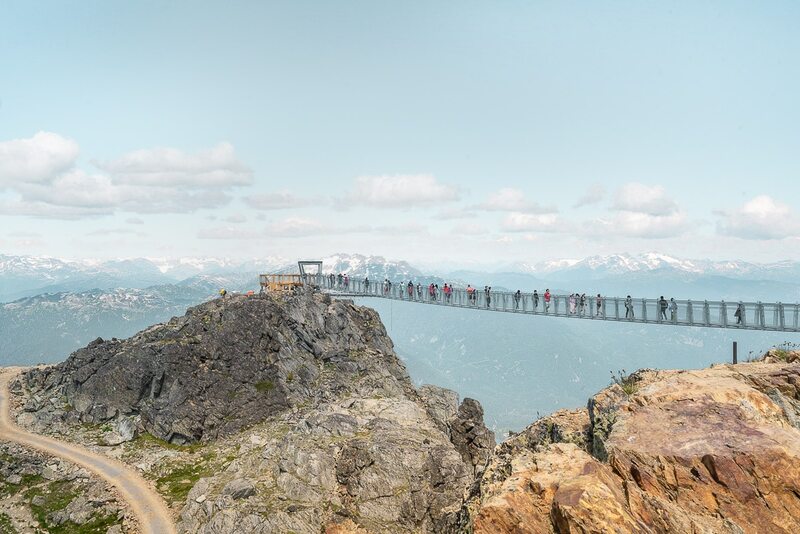 The bridge spans some 130 metres across the Whistler Bowl and ends in the Raven’s Eye Cliff Walk, and offers a 360-degree viewing platform. 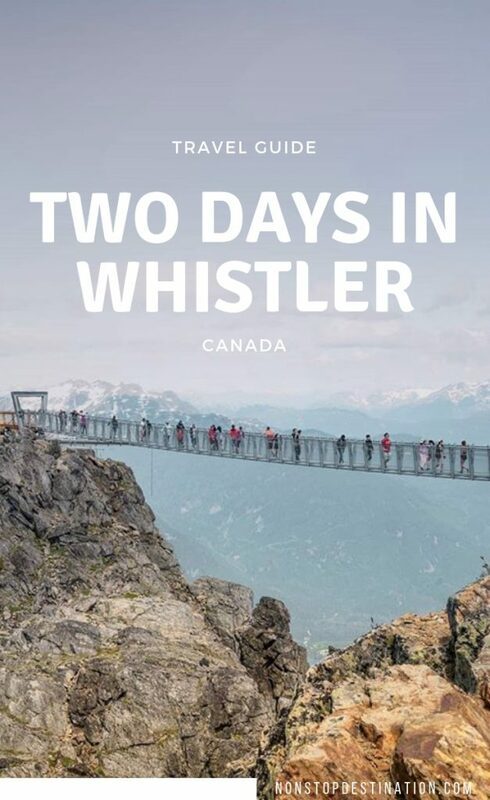 Up next was the Peak 2 Peak Gondola, which takes you from Whistler to Blackcomb Mountain. Suspended 436 metres high, and spanning some 4.4 kilometres, it has earned two Guinness World Records for being the “highest cable car above ground,” and “longest unsupported span between two cable car towers“. It’s a truly spectacular experience, with both awe-inspiring views of the mountain range and the valley! When we arrived back in Whistler, it was time for dinner. 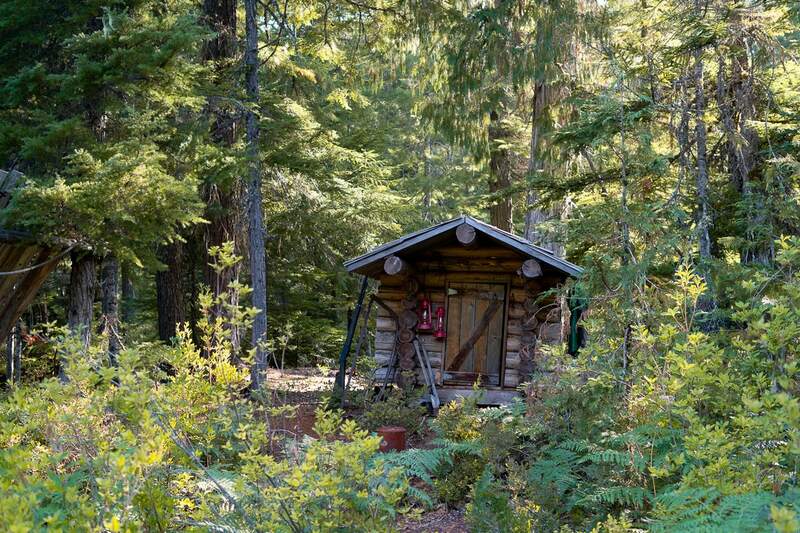 A little outside the village, you’ll find the beautiful Nita Lake Lodge, situated on the shores of Nita Lake. 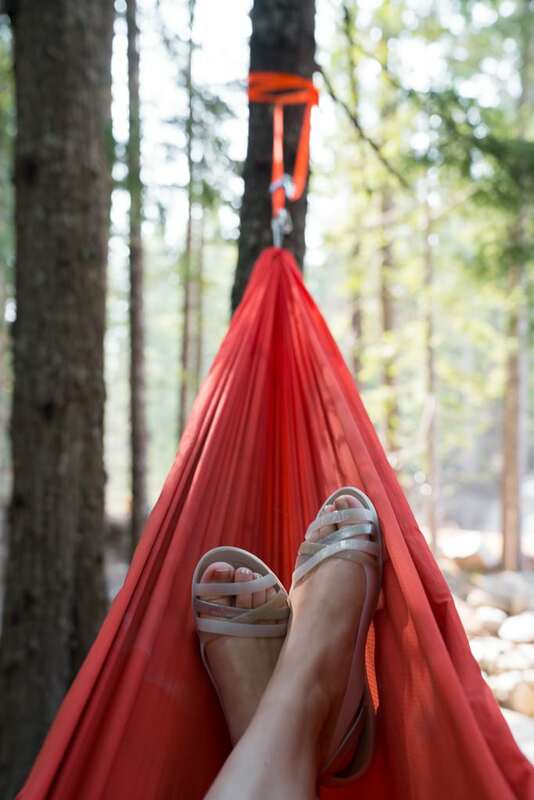 With our taste buds satisfied, we headed back to Whistler to embark on a magical forest walk in the Cougar Mountain. 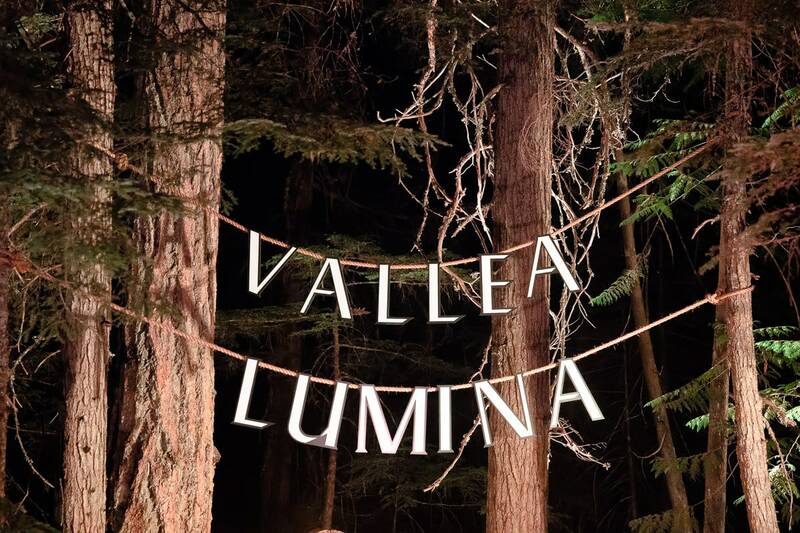 Vallea Lumina is a multimedia light experience brought to Whistler by the Moment Factory, a global leader in video, lighting, sound and special effects. 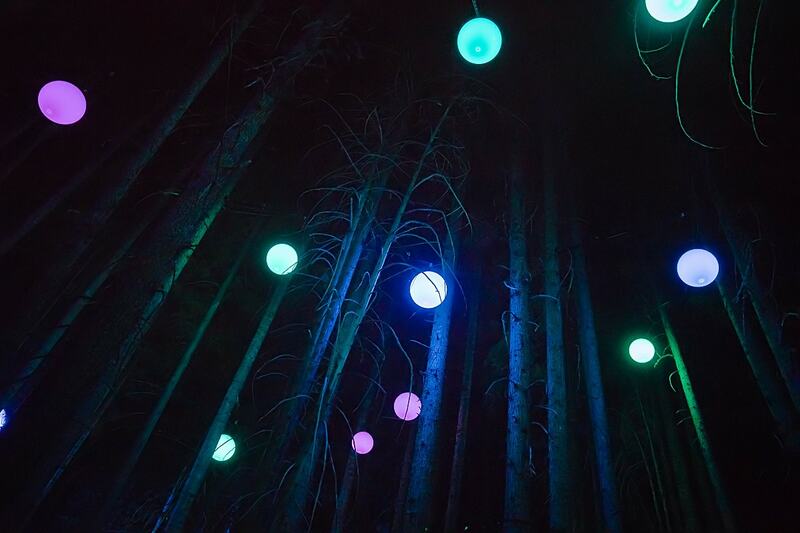 My sister and I were intrigued by the story-driven night walk and for some weeks now, we had been looking forward to this evening experience. 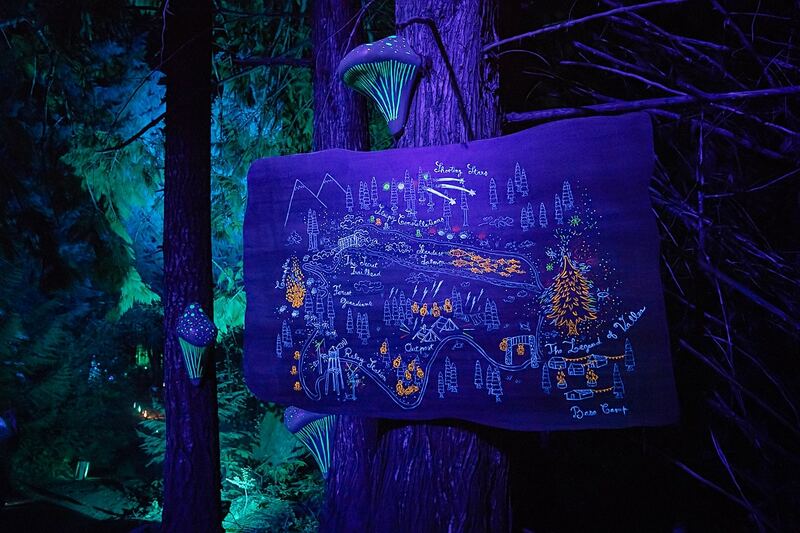 We walked through an old-growth forest, following an enchanting story, with beautiful visuals and sounds surrounding us. It was an incredibly captivating and immersive experience. 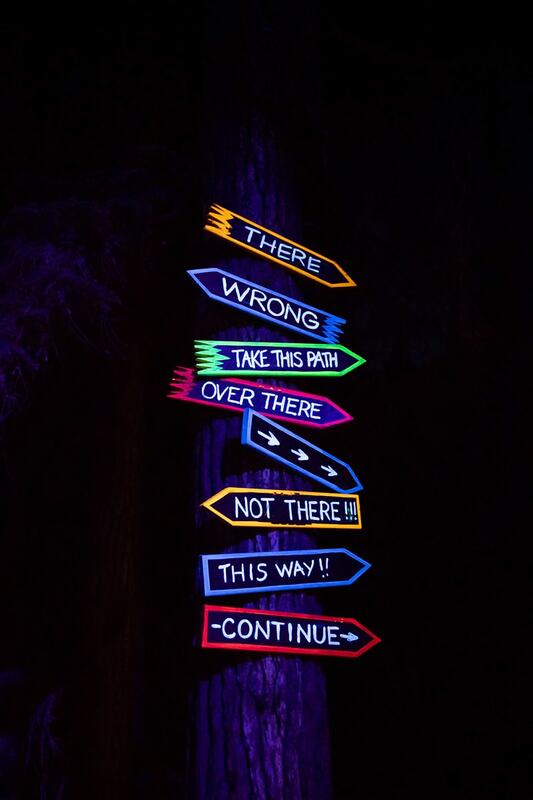 I urge everyone visiting Whistler to enjoy this unique, multimedia walk. It was almost midnight when we got back to our hotel, yet the village was still alive with party revellers and Crankworx visitors. However, our room was peacefully quiet, and we both fell fast asleep, as soon as we were in our giant, king-sized beds. The next morning, we were up early for our first activity of the day: an e-bike tour with Canadian Wilderness. After a quick breakfast, we met up with our guide, Dan, at the designated meeting point. 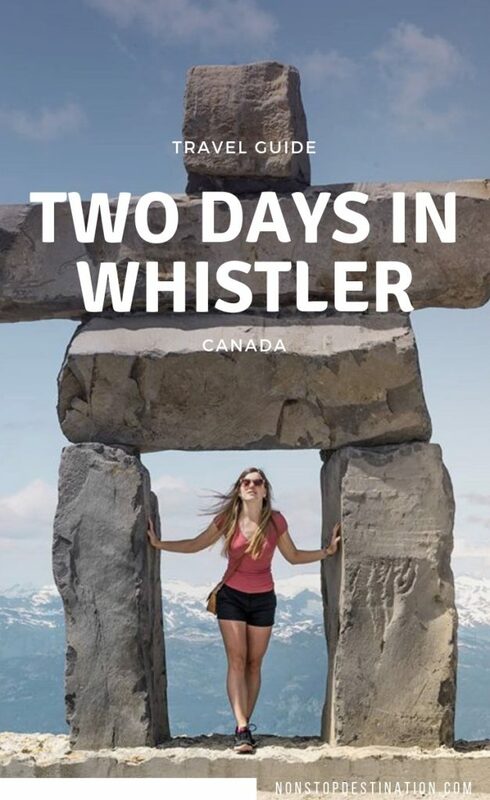 Dan is an enthusiastic Australian, who has been living and working in Whistler for a few years now. 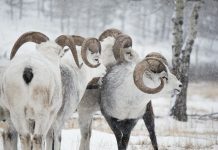 He drove us to Canadian Wilderness’ headquarters in the Callaghan Valley, where our mountain bike tour would take place. As Dan opened the door of the stall, we caught our first glimpse of the e-bikes. 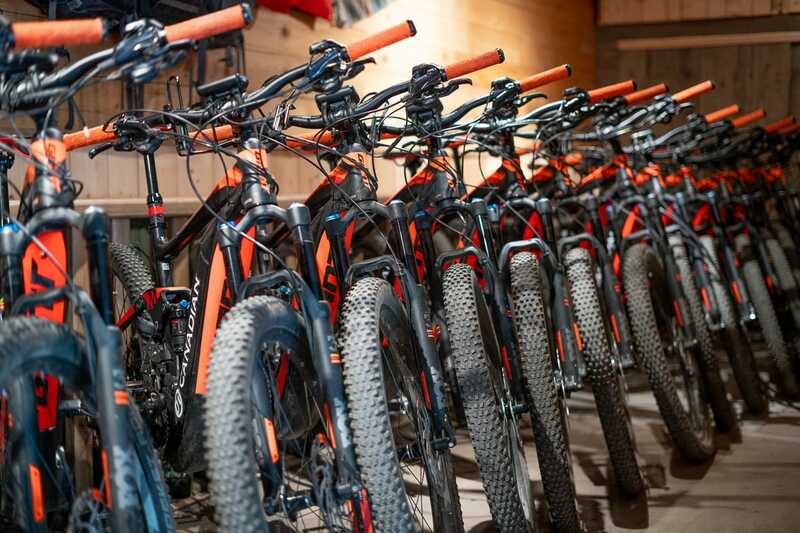 These were 500-watt, full suspension GIANT e-bikes all lined up and ready to take riders through the Canadian forest. After a few pointers on how to use the bikes, we were ready to go! The trip was exhilarating. 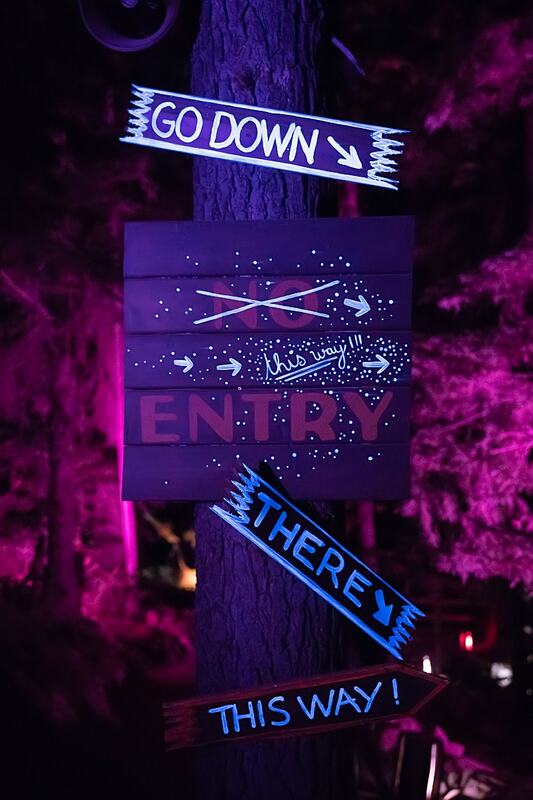 I loved rushing through the forest, on small trails going up and then downhill, without too much effort. The bikes have three levels of electric assistance, so, while riding, you can choose how much of a boost you need. 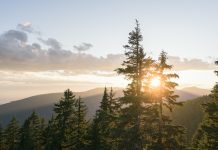 Occasionally, Dan would stop along the trail and give us some information about the forest and its unusual features, which included a cute, little hut by the lake and totem poles found along the Medicine Trail. 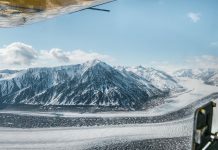 At the end of the tour, we visited Alexander Falls, a 43-metre-high waterfall in the Callaghan Valley, before we headed back to base camp, in a thrilling downhill ride through the valley. After all that excitement, it was time to relax. And what better way to unwind than to spend an afternoon at one of Canada’s most famous spas: Scandinave Spa. 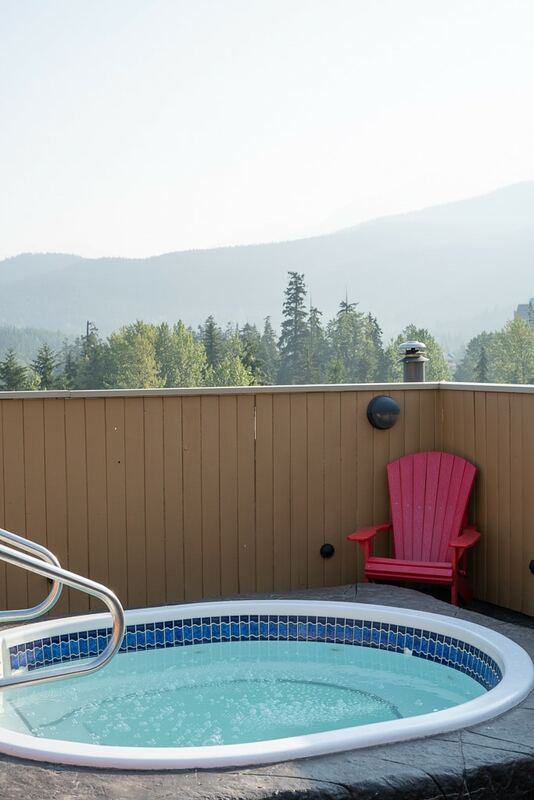 The spa practices the Scandinavian tradition of hydrotherapy, with the forests and mountains set as its backdrop. Throughout the afternoon, we followed the cycle of hot and then cold relaxation, after which we followed our ten-minute sauna session up with a cold bath and time spent in a relaxing chair, all in complete silence. The practice is said to improve blood circulation and activate the lymphatic system, which helps to assist detoxification. 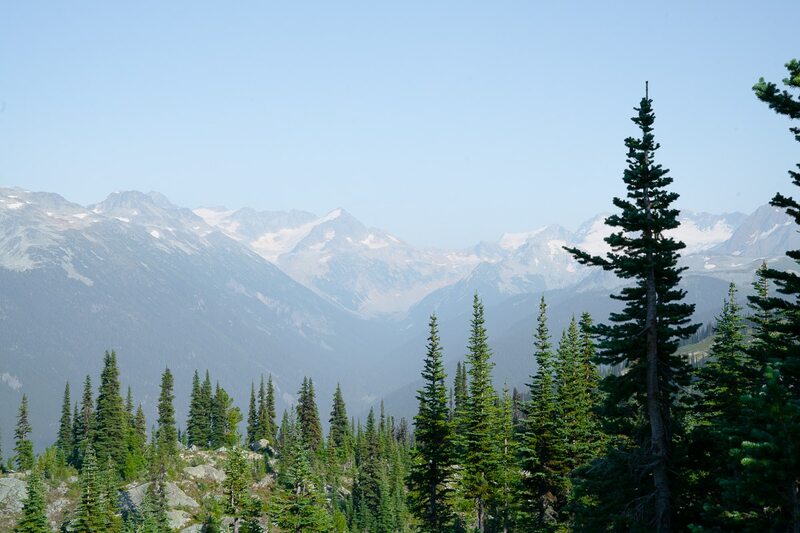 I had given my sister a glimpse of one of my favourite places in Canada, and I hoped she had fallen in love with Whistler, just as I had done three years ago. 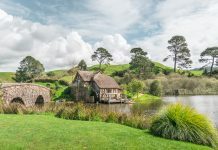 The two-hour drive gave us much time to let our thoughts wander, until finally, my sister broke the silence, suddenly saying, “I think I want to move here”… I smiled: I had succeeded. Tourism Whistler invited us to experience Whistler on a two-day trip. As always, all opinions are our own and you will always read our genuine thoughts and experiences.